The USS Underwriter, a navy gunboat, fought in the sounds and rivers of North Carolina during the Civil War. 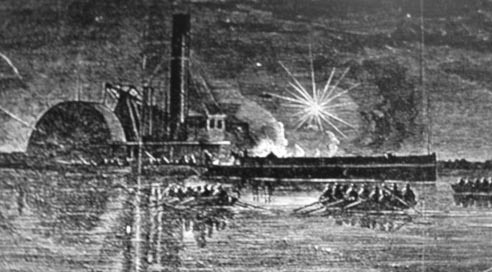 Early in 1864 the Underwriter was in the Neuse River at New Bern when Confederate forces under Maj. Gen. George E. Pickett mounted an attack to recapture the city. As part of the assault, about 250 Confederate sailors and marines in 14 boats and launches led by Cdr. John Taylor Wood secretly descended the Neuse River from Kinston and found the Underwriter anchored north of New Bern, close to the west bank of the river. In one of the most daring encounters of the war, Wood's command boarded the Underwriter shortly after 2:30 a.m. on 2 Feb. 1864, and after vicious hand-to-hand fighting on deck, captured the ship and part of its crew. Five Confederates were killed along with nine Union sailors, including Acting Master Jacob Westervelt, the Underwriter's commander. Many others were wounded. Unfortunately for the Confederates, however, the Underwriter's fires were banked and it lacked sufficient steam to get under way. Once it was clear that the vessel had been captured, Union shore batteries opened fire on the ship. Wood had no choice but to burn it and retire back up the river, carrying with him the wounded of both sides and the Union prisoners. The Underwriter finally blew up and sank as the fire reached its magazine just before sunrise. T. J. Scharf, The History of the Confederate States Navy from Its Organization to the Surrender of Its Last Vessel (1887). Royce Gordon Shingleton, John Taylor Wood: Sea Ghost of the Confederacy (1979). "Underwriter" Dictionary of American Naval Fighting Ships. U.S. Department of the Navy, Naval Historical Center. http://www.history.navy.mil/danfs/u1/underwriter-i.htm (accessed June 6, 2012). Conrad, Daniel B. "Capture of the USS Underwriter." Southern Historical Society Papers 19. Richmond, Va., January, 1891. Gaines, W. Craig. Encyclopedia of Civil War Shipwrecks. Baton Rouge: LSU Press. 2008. Good day, I researched a marine beret badge that was found among the wreckage of the Underwriter and it turned out to be from a Portuguese marine uniform. Is there a source that would tell me how a Portuguese marine would be involved in the Underwriter's attack? Was this ship 'Underwriter' originally used for immigration before being sold to the Navy? I'm trying to find information on the Underwriter that carried family members from Liverpool to New York 23 Apr 1861 - 21 May 1861. Thank you for your time. Thank you for visiting NCpedia and sharing this question. That's a great question! Unfortunately, NCpedia doesn't have any information about the ship's service before it became a military vessel. You may want to contact your local public library for help researching this.